Rationing in the Second World War meant that people had to be creative with the little food that was available to them. As such, almost every recipe had to be adapted to suit wartime conditions. Sugars and other sweeteners were in very short supply, so people were encouraged to use honey as a substitute. 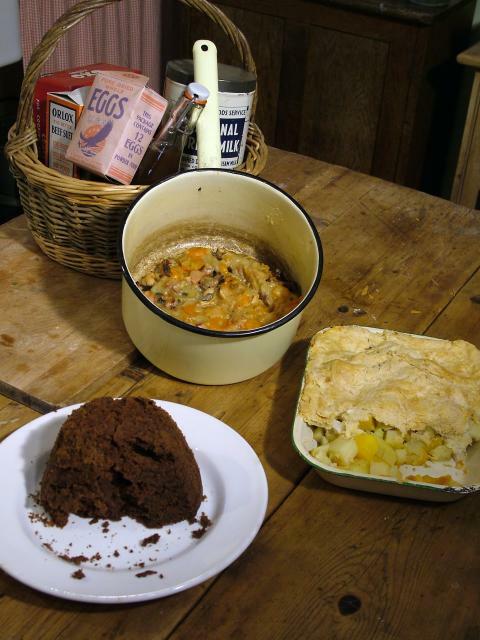 Here are some examples of recipes that would have been used between 1939 and 1945. Rub the fat into the dry ingredients and mix to a soft consistency with syrup and milk or water. Place the soaked stones prunes in the bottom of a greased basin, and pile the pudding mixture on top. Cover with a greased paper and steam for 1 ½ – 2 hours. Use the prune juice thickened with cornflour or custard powder as a sauce. Cook everything together with just enough water to cover, stirring often to prevent it sticking to the pan. Let the mixture cool. Spoon into a pie dish, sprinkle with chopped parsley. Cover with a crust of potatoes or wholemeal pastry. Bake in a moderate oven until golden brown. Extra sugar to sprinkle on top of the cookies. Cream the margarine and sugar together until light and fluffy. Beat in the flavouring and grated carrot. Fold in the flour, or flour mixed with baking power. Drop spoonfuls of the mixture into small greased patty pans. Sprinkle the tops with the extra sugar and bake at 220C, 425F, gas mark 7 for about 20 minutes.